Welcome to my second post of this weekend recap! Saturday was a super busy day. I went to the gym, ran errands, grocery shopped, cleaned our apartment and managed a little reading, all before the highlight of the day: Couples Dinner! Some of the girls from our normal Girls Dinner crew got together Saturday night. Except this time we brought the boys! I hinted at our plans, and even though they changed a bit, we had an absolute blast. I'm pretty sure we were the restaurant entertainment as we were laughing so loud throughout our meal. We ate at Adobo Grill, which is a fantastic Mexican restaurant downtown. John and I are big fans, and this is not our first time frequenting the place. It happens to be one of John's favorite restaurants and is downtown, so we could not have been happier. Our table started off with two orders of tableside guacamole. Let me tell you, this is fantastic. I could have easily gotten one order just for me and been perfectly content at making it my dinner. Lucky for everyone else I didn't. John and I opted to split two items for our entree. We got our usual tllayuda, plus the stuffed chicken, which our server recommended. I had two slices of the tllayuda and a piece of the chicken. Both were great, minus the cilantro that wound up on the chicken. I scraped it off, but I think I would have enjoyed it much more without that part. 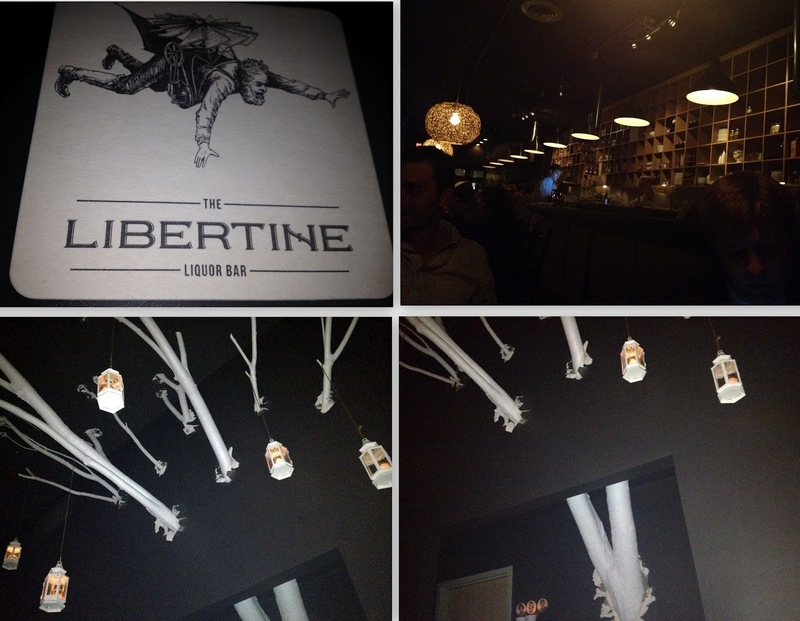 After dinner we decided to walk down the street to a new-to-us restaurant/bar, The Libertine. It had some super cool decor inside, and I was especially enamored with the white tree coming out of the wall. How cool is that? They had a really unique cocktail menu, too! Ally was very excited to see Pimm's which I had never heard of! It was full of ginger and other flavors, and she seemed to really enjoy it. I only have two complaints about our experience. The first would be the super snooty hostess, who was probably the rudest person I've encountered in the food service business. The second is that the very dim light in The Libertine did make me a wee bit sleepy. We only stayed for one drink, which is probably for the best. This girl would have taken a nap! After we left, Swade and Adam headed to see Swade's visiting family members. Ally, Wes, John and I walked a bit farther to Tastings, a wine bar located inside The Conrad. Ally and Wes picked out a great wine to try, and we enjoyed dreaming about our upcoming vacation. We always have the best time with those two, and I have no doubt our vacation will be a blast. I can't get enough guac! My weekend was super relaxing, like it should be!